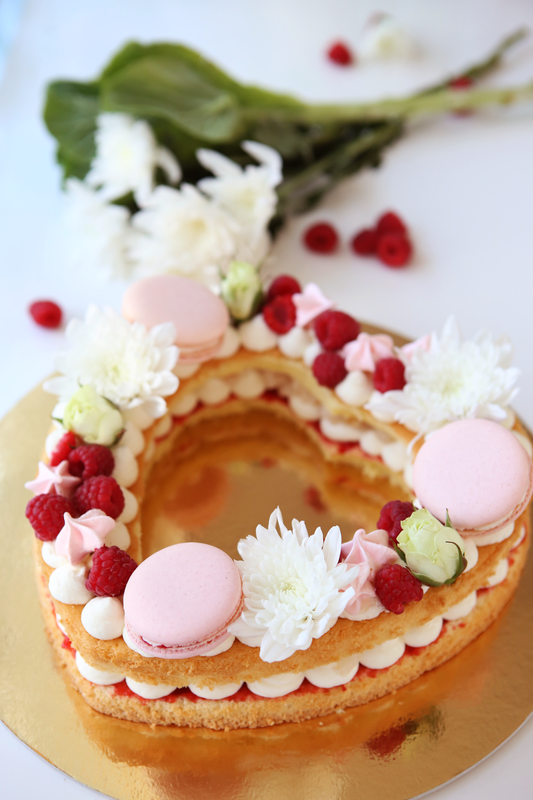 It's Valentine's day today and while it might be too late for anyone looking for Valentine cake idea, at least this can be an inspiration for other occasion, whether it's the decor idea, or the cake idea. You can change up the shape as you'd like, such as numbers, circles, alphabets, or anything at all. My husband and I have never been into Valentine. In fact, we always opt not to go anywhere during Valentine's day as restaurants are all booked and everywhere is so crowded. If anything, we'd try to schedule it maybe the day after as there is no line to get into our favorite restaurants #notafanwaitinginline. I think if I remember correctly, he gave me flowers on the first year of dating, and even then, it was delivered by the flower company as he was on a business trip. So why did I make this cake you might ask? I don't know exactly. My husband is not a big cake eater and we both know that we'd rather stuff our face with taco or ramen instead of a pretty cake or a box of chocolate wrapped in a bow anytime. It might be all the pretty pink stuff I kept seeing on the instagram or blogs. 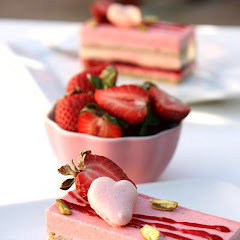 I'm a sucker for anything pink and even though we don't celebrate Valentine, I have always loved seeing and making anything Valentine-inspired, they're all so pretty and so delicious-sounding! Just think how good all these desserts are, raspberry sorbet and champagne or prosecco, creme brulee, molten lava cake, even just plain ol' brownies excite me! This cake is more of an idea than a recipe. 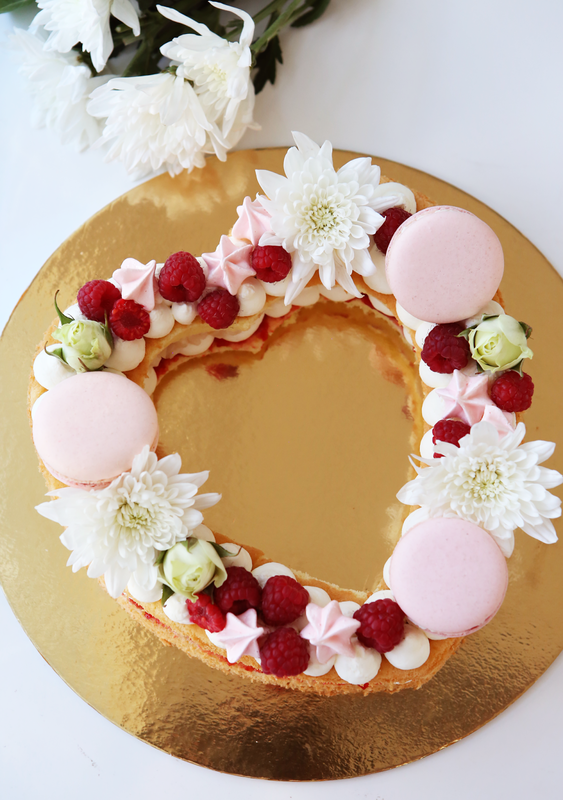 Lately, I have been seeing this kind of cake decor, shaped in mainly numbers or alphabets. I was so intrigued by the pretty decor that I was willing to make all the different components for the decoration, and that's not usually my favorite thing to do. You can of course change up the decor on the top of the cake or the color scheme, depending on the flavor or occasion. I saw people used all chocolate decor instead (think kit kat, Reese's, Ferrero, etc. ), a good use of those leftover Thanksgiving candies. I love how it turned out, it was so pretty (if I can say so myself)! 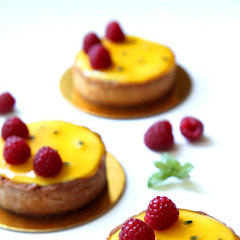 It is so different than the entremets I have been making, in which my motto has always been "less is more". 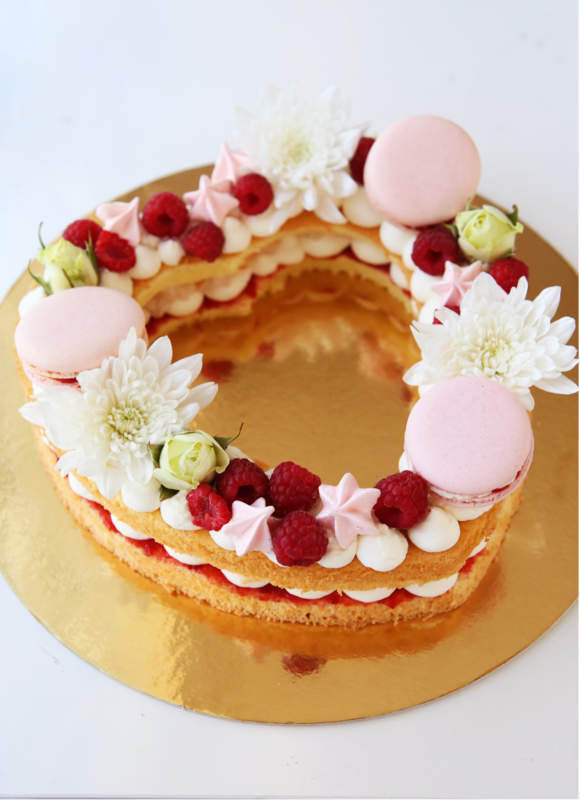 This cake has flowers, meringue cookies, macarons, raspberries, the more the merrier. If it wasn't for all the different decorations, I would say this cake is pretty straight-forward to make. 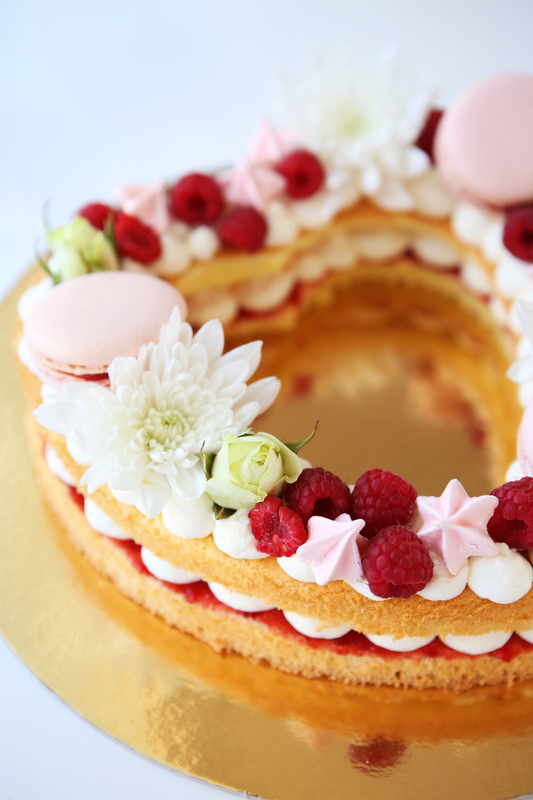 The inside of the cake is raspberry jelly that I spread on top of the cake, followed by dollops of rose-flavored mascarpone cream, topped with lychee pieces. 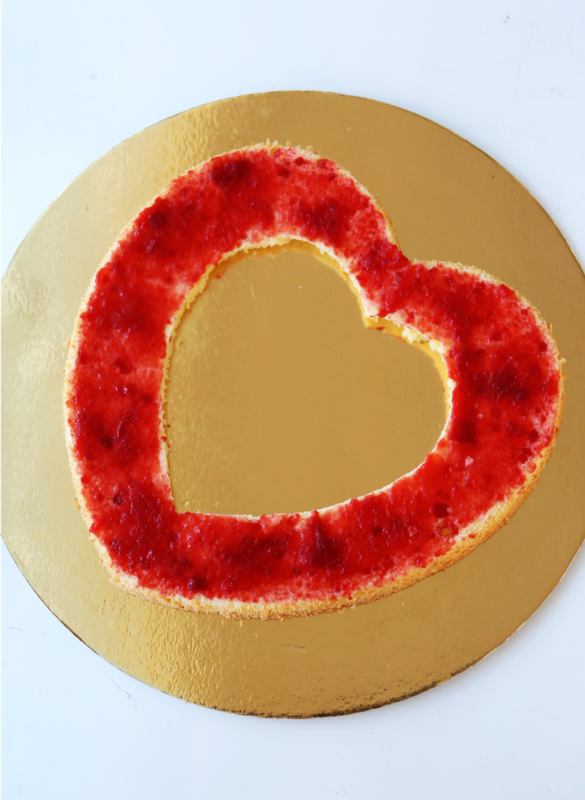 I took the middle heart cut-out and do the same with the filling without the 2nd layer of cake on top, decorated simply with raspberries and a sprinkle of powdered sugar. It would look super glam with red roses all over the top of the cake too! It's one of my favorite look for romantic cake, though sadly I don't have any roses in hand (except the tiny ones I used to decorate the big cake). 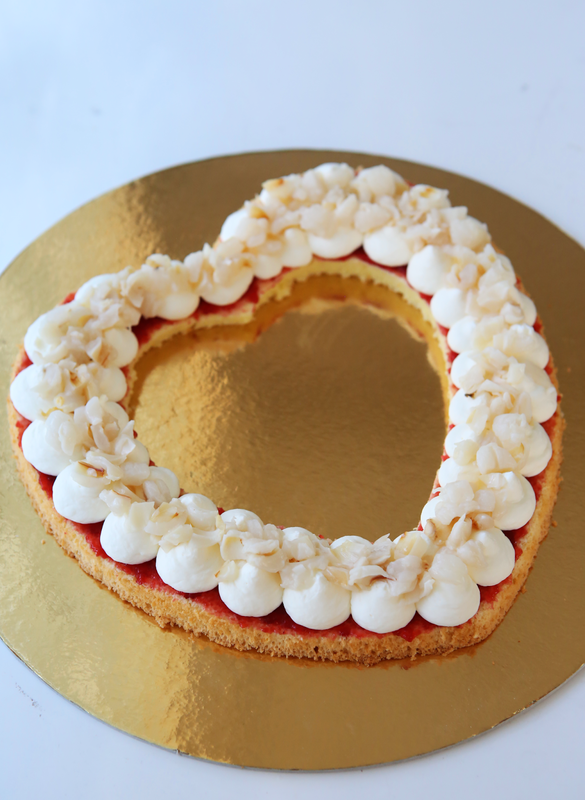 For a simpler idea, you can also do strawberry shortcake this way. Either use the same mascarpone cream or just plain heavy cream (I love orange flavored cream with strawberries), topped with strawberry slices. 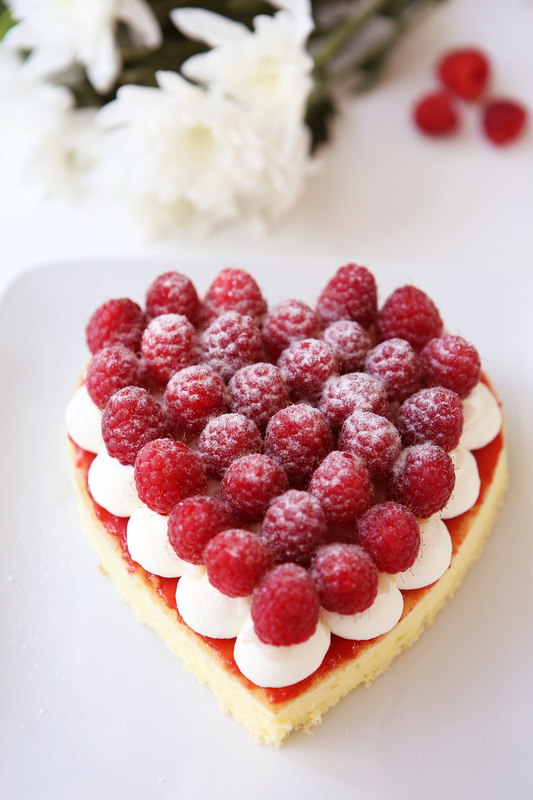 Then you can decorate the top with strawberries instead of raspberry. Or how about the chocolate version with chocolate cake, chocolate cream/ganache topped with chocolate shavings maybe? Endless possibilities. Off topic here, if you're wondering why I took a few month-break right after I said I was back? Well, it turned out that baby #2 is coming! It was a surprise (at least timing-wise), and I began feeling the nauseous feeling while making a wedding cake a few months ago. I haven't posted it here yet, but you can follow my instagram @the.bs.life for a sneak peak. The day after the wedding, I was pretty much a dead meat. I couldn't stand up, walk, eat, or anything at all! I have never been the best at pregnancy, I was bed-ridden for both pregnancy for about 3-4 months. This pregnancy took longer, about 20 weeks before I can start feeling like a person again. I am in the middle of my 2nd trimester and while I have been cooking up a storm almost daily in my kitchen, things I baked have been mostly comfort cake, childhood desserts. 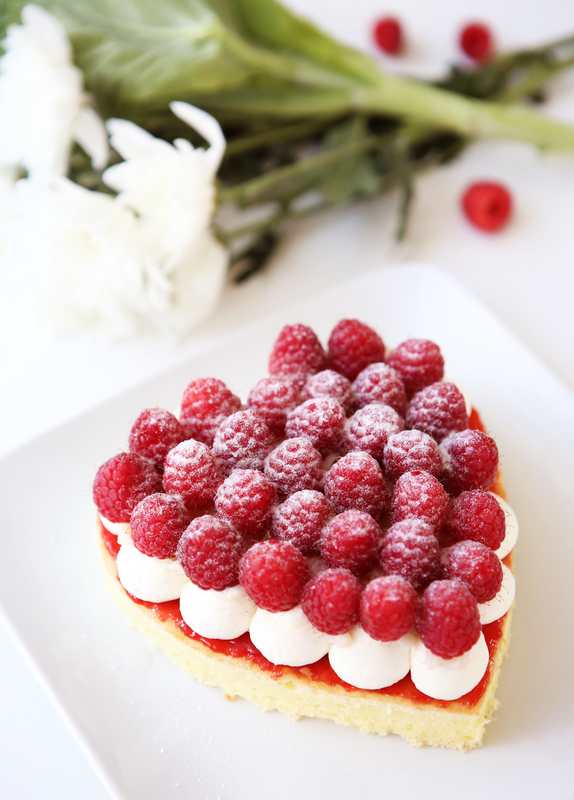 But as Spring is coming, I am itching for strawberry dessert, lemon, anything bright. In fact, my aunt-in-law just sent us a huge bag of gorgeous meyer lemons, now sitting prettily on my counter. 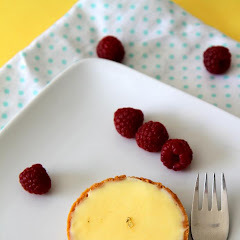 The infamous lemon tart might be coming soon from my kitchen. Such a beautiful cake looks yummy! Thanks for sharing this great recipe.